US-backed forces say they will not allow Assad regime to cross Euphrates River to take additional ISIS territory in Deir ez-Zor. Syria — In a blatantly ominous move—solidifying the notion that the U.S. military machine supports and sustains the proliferation of ISIS—U.S.-backed rebels openly stated they will prevent the Syrian army from crossing the Euphrates River to recover eastern Syria from ISIS militants. The oil-rich province of Deir al-Zor is Islamic State’s last major foothold in Syria and Iraq. It is bisected by the Euphrates River. The threats by the U.S.-backed Syrian Democratic Forces (SDF) to attack the Syrian army for attempting to cross the river is in de facto defense of ISIS. As Reuters reports, military council commander Ahmed Abu Khawla warned government forces and their militia allies against firing across the river as his fighters close in — something he said had happened in recent days. “Now we have 3 km between us and the eastern riverbank, once our forces reach the area, any shot fired into that area we will consider an attack on the military council,” he said. As we’ve seen this year, when the Assad regime is allowed to go after ISIS, they are successful. When the US is not destroying their military bases or shooting down its jets, the Syrian army has proven that they are quite capable of taking back their country from the clutch of terrorists. Because the US can’t complete their mission of destabilizing Syria without ISIS, the announcement by the SDF to protect the terrorist-held region should come as no surprise. However, that point may be moot because according to Russian foreign ministry spokeswoman Maria Zakharova, the Syrian Army has already crossed. “The suburbs of this provincial center (Deir al-Zor) have been liberated. Advance units have successfully crossed the Euphrates and are holding positions on its eastern bank,” she said. Bouthaina Shaaban, an aide to Assad, said they are ready to fight the SDF to free the rest of their country. “Whether it’s the Syrian Democratic Forces, or Daesh (Islamic State) or any illegitimate foreign force in the country … we will fight and work against them so our land is freed completely from any aggressor,” she said in an interview with Hezbollah’s Al Manar TV. “I‘m not saying this will happen tomorrow … but this is the strategic intent,” she said. As TFTP has consistently reported, it is no secret that much of the opposition forces in Syria, like the SDF, are aligned with ISIS. In fact, there was actually proposed in legislation by Congresswoman Tulsi Gabbard in the House and Senator Rand Paul in the Senate to stop arming the US-backed rebels—because they are terrorists. “For years, our government has been providing both direct and indirect support to these armed militant groups, who are working directly with or under the command of terrorist groups like Al-Qaeda and ISIS, all in their effort and fight to overthrow the Syrian government,” Gabbard said earlier this year. 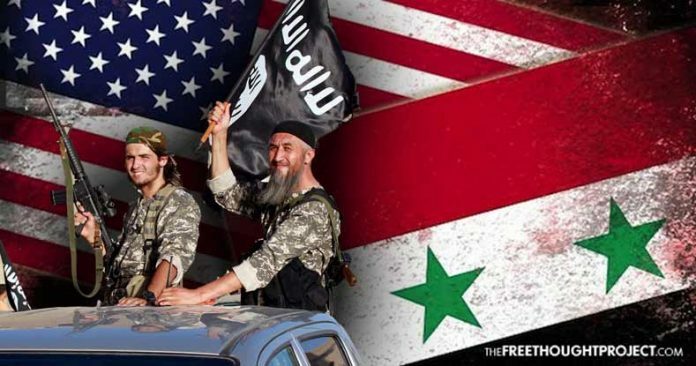 As the Free Thought Project reported in April, the US knew Al-Qaeda leader al-Zawahiri called on Muslims in Turkey and the Middle East to aid the rebels in the Free Syrian Army. From this day forward, the lines between who Al-Qaeda or the ‘rebels’ actually were — became heavily blurred. 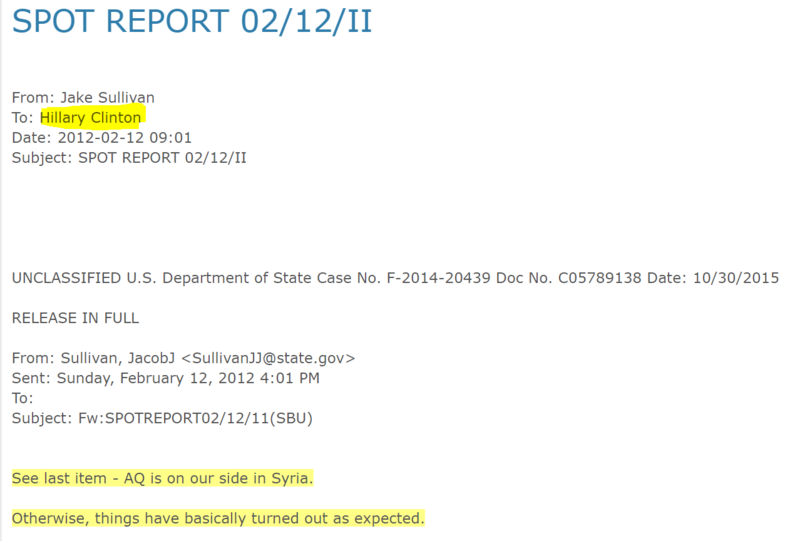 But, according to the email, the state department did not care as they knew Al-Qaeda was on their side. In spite of Trump ending the CIA’s program of funding and arming ISIS in Syria, the Pentagon was exposed using backdoors to continue their support for the terrorist network. As TFTP reported, a damning new report by the Balkan Investigative Reporting Network (BIRN) and the Organized Crime and Corruption Reporting Project (OCCRP), published this week, exposes the Pentagon’s falsifying of documents – likely to hide the use of a shady network of private arms dealers, intimately connected to Eastern European organized crime groups, to transfer some $2.2 billion dollars worth of mostly old Soviet weaponry to al-Qaeda affiliates in Syria. Sadly, the funds flowing to Syria to support terror are whitewashed and justified by the government because they are aiding “moderate rebels” in their battle against Assad. However, as Congresswoman Gabbard noted, who actually went to Syria to see for herself, there are no moderate rebels.